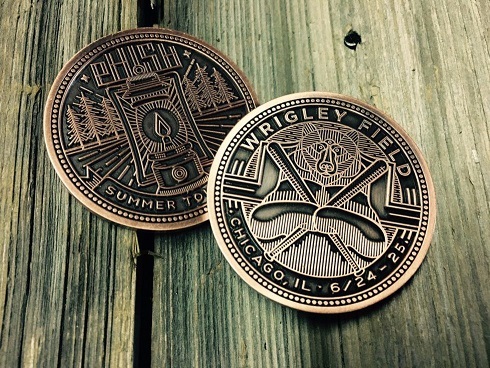 Limited Edition coin from Phish's Summer 2016 Tour stop in Chicago at Wrigley Field. The coins measure 1.5" in diameter, 3.5mm" thick and are brass/zinc composite, plated in a shimmering gold finish. Each coin is die struck, hand filled with individually laser engraved numbered on the edge. Each comes encased in an archival clear hard shell.